In college, I couldn’t decide whether to major in biology or art. I ended up with a bio degree just because I’d taken a couple more classes in it. 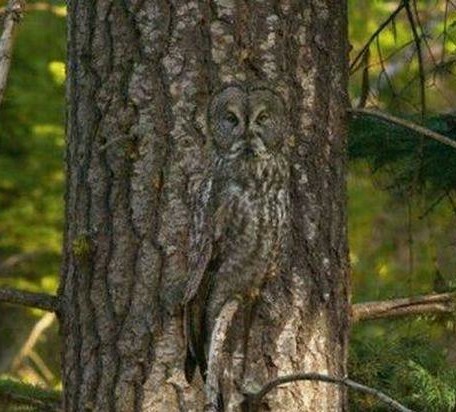 One of those classes was how birds have adapted their coloring for camouflage and mating displays. One of my favorite stories was of the bittern. American bitterns are fairly big, standing 2-3 feet tall with a wingspan of up to 4 feet. They are somewhat rare in the bird world in that they have stereoscopic vision. Most birds have eyes on the side of their heads, seeing in opposite directions. Bitterns have their eyes set low on their heads so if they raise their beaks or peer into the water for a hapless fish, their sight lines converge like ours do, giving them better depth vision. Bittern using its stereoscopic vision. 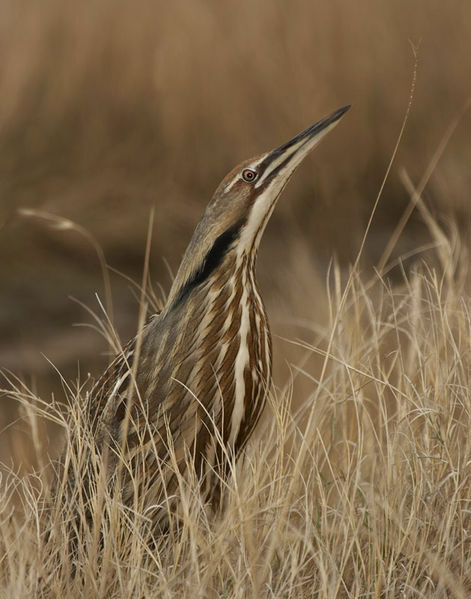 A highly secretive and solitary bird, the bittern lives in shallow marshes, creeping about unseen for the most part. 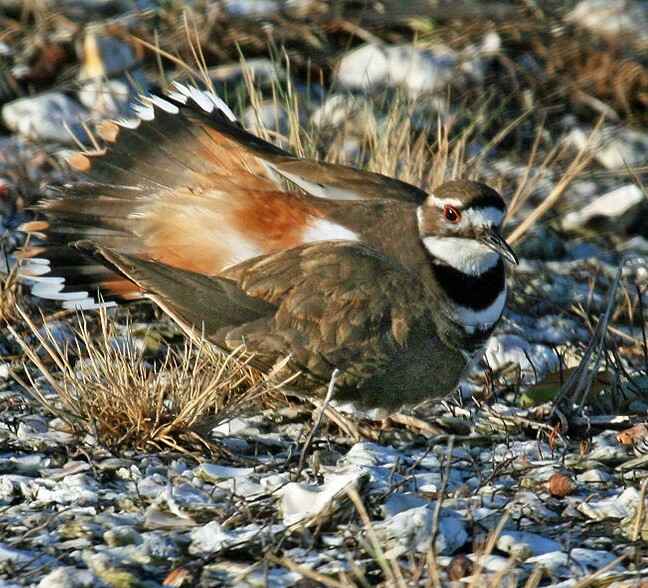 Its breast is striped to mimic the surrounding reeds. If it feels threatened, it raises its beak and sways gently, blending in perfectly. Perfectly, that is, unless it happens to be caught out in the open. The story I heard was that someone happened upon one crossing a road. 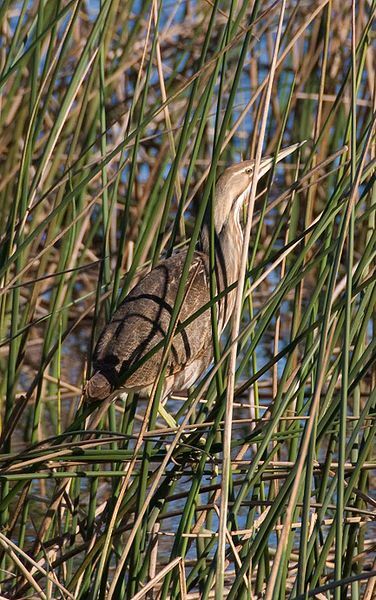 Surprised, the bittern froze, beak pointed to the sky, rocking side to side as if it was still invisible in the reeds. Just think how that must have looked!! Not long after taking this class, I got a job with The Nature Conservancy studying sandhill cranes and black terns at Sycan Marsh in central Oregon. I loved this job but there was a lot of tedium involved. One day I was banding terns, catching them in traps placed over their nests, which were on little mounds surrounded by water. This involved endless waiting, up to my knees in soggy marsh with nothing to do but be zen with the surroundings. 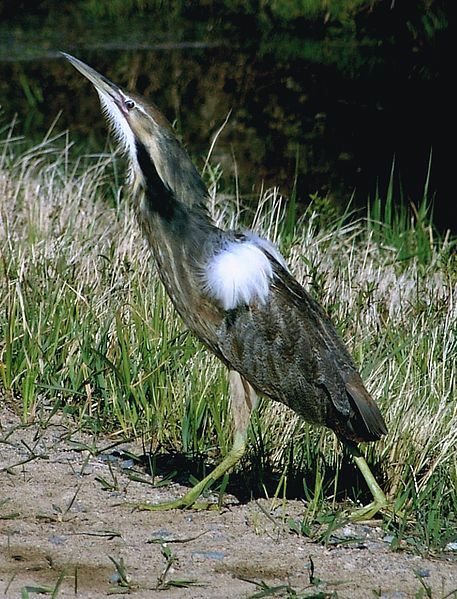 To my delight, I heard the peculiar call of a bittern nearby, like someone gulping bowling balls. I could hear it moving around me but couldn’t spot it. This went on for hours. For all I saw, it could have been a ghost. Out of nowhere, a thunderstorm came booming over the ridge. Lightening seared the skies, headed my way. Probably not the best idea to be the tallest thing around, in water no less. Heart racing, I dashed about throwing traps off the nests and hightailed it out of there in my clumsy waders. As I tore through a clump of reeds, wouldn’t you know I nearly stepped on that bittern guarding its nest. Wings fully spread, it raised up right in front of me. I’m not sure which of us screamed louder. Keeling over from shock, and worried about the approaching storm, I still managed to flag that clump of reeds to come back to later (bittern chicks are super cute). Couldn’t find it again, though. It was like it had never existed. By now you are wondering what this has to do with tiny houses. I’ve been thinking a lot about how I will find a place to park my house. This led me to thoughts on adaptability and camouflage, which led me to bitterns…makes total sense, right? One of the great things about owning a tiny house on wheels is that you can take it with you whenever you need to relocate. One of the more difficult things about owning a tiny house on wheels is finding property where it, and you, can reside. Some people own land but many need to rent. The rental rates are generally cheaper than renting a house or apartment because the landlord doesn’t have any investment or maintenance costs in the house itself. In some ways, there are more opportunities for finding a parking space because people who wouldn’t normally consider taking on all the building and permitting associated with setting up a rental unit on their property might be willing to host a tiny house for some extra cash. But it also makes it trickier for the tiny houser who is trying to figure out how to connect with potential landlords who have not been part of a rental market and its advertising mechanisms. There are many other issues which make the search challenging including variable zoning laws, figuring out utilities, and establishing the dynamics of sharing land, among others. Fortunately I’m at least a year out from needing a parking place in the Bay Area so I have some time to learn more and develop a strategy (I’m fairly sure my best bet is going to be word-of-mouth). Since I’m in the design phase now, I’ve been wondering: How can I design my tiny house to make it easier to find a place to park? Whether it’s animals, avians or humans, we tend to spruce up when we’re looking for a mate. This can become a delicate balance of putting on our best finery, expressing our unique creativity, and showing that we have what it takes to be a good, reliable, responsible partner. The same is true for tiny housers looking for future landlords. One of the reasons I’m drawn to tiny houses is that I see them as one big art project. The potential for creativity and self-expression is endless. Some of the houses I’ve seen online are crazy great, but it’s also crossed my mind whether the wilder ones have had a harder time finding a place to park. If you own your own land and can tuck yourself out of sight of neighbors, you have a lot more flexibility in what you can do – flamboyant colors, organic free-form growths of salvaged materials, Battlestar Gallactica starship-as-house concepts, you name it. If you know you’ll be looking for rental space, you may want to design your exterior so it has a higher chance of blending in with a neighborhood. There are two reasons for this. One is that you’re going to need to convince a potential landlord that this is something they would want on their property. If they live on the same land, chances are it’s going to be visible from their house. Is it something they would want to look at every day? Your house will also be a statement about you. Like it or not, the look and condition of your house will say something about your ability to pay rent and be a good landmate. It’s very similar to wearing your best suit for a job interview, so while it may gall your artistic, non-conformist sensibilities, you might have more options if you tone the look of your house down a bit or play up the “cute factor” of tiny houses (you can always go wild with the interior). If this goes against your grain, I wouldn’t worry about it. With enough hard work and outreach, I’m sure you can find a place to park anything you create; it just might take a bit more time and effort. The second reason to blend in has to do with the neighbors. Even if a landlord is open to renting to you, the people next door may be less keen if they view your creative masterpiece as an eyesore. Beauty is in the eye of the beholder, and you can’t please everyone, but the more innocuous your house is the less likely it will rub the neighbors the wrong way. This is important because, as any tiny houser newbie quickly learns, tiny houses fall into a gray area in the zoning laws. Because they’re on wheels, they are usually considered a recreational vehicle but most jurisdictions, at least in more urban areas, don’t allow you to live full-time in an RV. It becomes a delicate little dance. Since most zoning violations are complaint driven, and complaints are most likely to come from upset neighbors, you can head a lot of issues off at the pass by making sure they have nothing to complain about. This includes allaying concerns that your house won’t lower the quality of the neighborhood and affect their property values. I was originally planning on a cheery red roof until I looked into a potential parking spot that would have been right up against a fence. I realized the people on other side would have the equivalent of a giant Heinz ketchup billboard peering down on them as they sat poolside, which likely would not have gone over well. Perhaps a more muted color would have been more palatable. There are other reasons I’m leaning away from a red roof, but the fact that it might not adapt to certain circumstances did give me pause. While there is tendency to want to stay hidden to avoid unwanted notice, there are also some strong arguments to be more visible. As more and more people choose to pursue life in tiny houses, there is increased urgency to engage local officials and planning departments in discussions to update zoning laws. There needs to be more dialogue to find ways to make it easier for those that want to go tiny, while still addressing valid concerns about safety and surrounding property values. build capacity of DC tiny house designers and builders. All of these advocates recognize that the way to gain wider acceptance, change the minds of government officials, and grow a broader community of tiny house enthusiasts is by putting their best tiny house foot forward, by building the best nests they can. By demonstrating that tiny houses can be built so that they are well-designed, safe, and attractive, they are helping all of us in the long run. So there’s something to be said for being both the bittern in the reeds and the one out calling for mates. The important thing is to try to anticipate possible future scenarios to the extent you can, make conscious choices, and be a good neighbor. There may be times when you want to be under the radar and other times when you want to strut your stuff. Design to be adaptable. Glad you liked it, A! Thanks for the compliment.